The Tarot is mysterious and fascinating. Often Tarot cards are depicted in films and on television as prophesying death, doom or troubles ahead. Tarot cards have been used as tools of divination for centuries, yet their beginnings remain steeped in speculation and secrecy. Tarot cards have grown in popularity over the last century, and with hundreds of decks to choose from and more appearing on the market each year, more and more people are becoming drawn to them. Whether you’ve had your cards read by a psychic or happen to be a practicing metaphysician who uses cards regularly yourself, the incredible power of Tarot to outline the past, affirm the present, and illuminate the future is undeniable. It’s purported that the 78 images contained in a deck of Tarot cards originated from a secret text of the ancient Egyptians known as The Egyptian Book of Life. This was a tome inscribed on stone tablets that was only accessible to the high priests, priestesses and pharaohs of Egypt. In fact, it was carefully guarded and kept far from the eyes of their subjects. How this book fell into the hands of so-called commoners is a fascinating story. It is believed that at one point, these stone tablets were stored in the Library at Alexandria, the largest library in ancient Egypt. During the third century B.C., the library was destroyed by fire. As the story goes, the curators of the library wanted to preserve these sacred tablets but didn’t want them to fall into the wrong hands. They decided to divide them up and give random sections of them to passing gypsies, for they assumed that the wayfarers would never discern the power of the information inscribed into the tablets. However, over the years, the gypsies did realize the magic contained in these tablets. Because the stones were too heavy for these nomadic peoples to continue carrying, they began etching the images from the originals onto tin plates, which were far easier to carry and work with. It didn’t take them long to discover the fortune-telling properties of these images, and they began to use them for just this purpose. As time passed, the gypsies continued to copy the images onto smaller and smaller plates, and then onto paper boards. As the gypsies traveled across the continents of Africa, Europe and beyond, these fortune telling devices seemed to disappear into obscurity for a while. The cards reappeared in fifteenth century Italy, but this time, the images had been replaced by pips (spades, clubs, diamonds and hearts), and the only remnants of the originals remaining were the Joker (The Fool), and the Jack (Knight), Queen and King of each suit. Europeans used these decks for card games. At some point, 22 additional cards were added (or re-added) to these decks, and these eventually became the Major Arcana seen in today’s Tarot decks. On the surface, the cards were generally used for entertainment, but in the background, metaphysicians like Nostradamus, Aleister Crowley, and even Leonardo Da Vinci were practicing the art of prophecy with these decks. It wasn’t until 1909, when the first Rider-Waite deck hit the market, that Tarot cards again portrayed all the images of each card in the deck, and were made specifically for use as a divination tool. Since its introduction, the Rider-Waite remains to this day one of the most popular decks available for this purpose. When using Tarot to read the future, each of the 78 cards in the deck are very important, for they represent man’s journey to self-actualization and spiritual wholeness as illuminated in the Egyptian Book of Life. So when you purchase a deck of Tarot cards today, you’ll find yourself in possession of one of the most popular, powerful and versatile tools of divination available. These decks are rich in history, and when used properly, can be a wonderful tuning device for self-awareness and guidance. Susyn Blair-Hunt, Ms.D., is known internationally for her psychic readings, daily horoscope column here at Kajama, and her weekly radio show Insights. Along with her radio program, her bi-monthly newsletter StarNotes, private readings and advice column, Susyn also offers classes and private tutoring in astrology and Tarot. Susyn has been a professional metaphysical consultant for over 25 years and holds a Doctorate in Metaphysics along with certification by The American Association of Professional Psychics and the American Tarot Association. 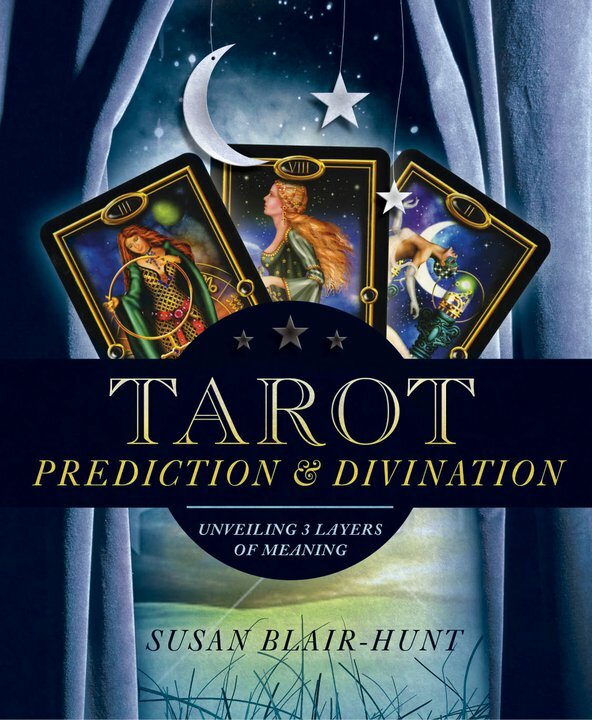 For a complete guide to reading the Tarot, check out Susyn’s new book, Tarot Prediction and Divination: Unveiling Three Layers of Meaning, which is available at llewellyn.com.